Here it is the end of January already and still no more flying to report. This has been a really unusual month for us in Reno. Our usual precipitation is roughly 7″ per year and this month we received 5.5″ of either rain or snow. Another storm is moving in tomorrow night that is supposed to bring rain to the valley and snow up on the tops of the mountains. The ski areas are loving it. Some of them have received more snow this year than has ever been recorded. It’s not that there haven’t been days here and there that have been great for flying, I’m just not legal to do it in my own plane. I started the annual inspection on the Swift but have not yet finished it – parts purchase problems, among other things. Meanwhile, since I haven’t had a plane, my Flight Review has expired as has my medical certificate. I guess I could wait until May 1st and not bother with a 3rd class medical. I haven’t decided on that yet. It will depend on when I can finish the annual inspection and get the paperwork completed. While the weather has been winter-like my prop has been out for overhaul. It should be back, at least in the hangar, by next week. Temperatures are starting to moderate so maybe I’ll be able to get back to working on the plane without having to wear 14 layers of clothing. Unheated hangar. A couple of flight instructors in the area have purchased an AATD and will be offering it for rent. I’ve been considering doing some instructing in it. They seem to be having a challenge getting it all set up and ready to generate income. The image they show in their flyer is a Precision Flight Controls CRX Max but I have yet to see it. They said something about having to have the cockpit enclosure built locally so I’m not really sure what model they purchased. The Reno-Tahoe Airport Authority(RTAA) recently instituted Commercial General Aviation Minimum Standards (GAMS) at RNO which specify the minimum requirements and the licensing required to do business on the airport. 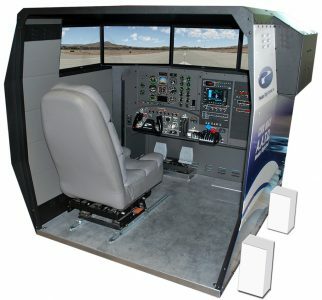 As a result, this simulator is off airport property in a business park near the airport. The RTAA also controls the Reno-Stead Airport (RTS) and is in the process of doing the same thing there with respect to GAMS. The proposed RTS standards are identical to those instituted at the airline airport (RNO) with only airport name changes. There is a committee of RTS tenants/businesses going through the proposed GAMS but so far all suggestions for changes/modifications to the proposed standards have been ignored. The RTAA has also notified the FBO on the Reno-Stead Airport that they have been in operation at their location too long and in four years the FBO operation will be placed out to bid. It will be interesting to see what happens next. The Reno-Stead Airport is a beautiful facility that is constantly being improved. This year they are digging up the Pavement in front of the Air Race permanent grandstands and putting in ‘Hardstands’ – reinforced pavement areas that will accommodate heavier fire tanker aircraft. When it gets really hot in the summer heavier aircraft tend to sink into the softened asphalt pavement that is currently in place. Next year the plan is to dig up the main runway (8-26) and completely rebuild it as they did to runway 14-32 a few years ago. The only other thing you could do to the airport is tear down all the old Stead AFB hangars and build big corporate facilities. Oh, and take down all the mountains around the airport so it would qualify for reasonable instrument approach minimums. There are too many close-in obstacles to permit a safe missed approach corridor so the missed approach climb requirements for instrument approaches require high instrument minimums – the RTS ILS 32 approach requires 3 miles visibility with a Decision Height at 1380′ agl.